There are many reasons to include native plants in your garden. Native species provide excellent cover for wildlife. Many are wonderful for attracting beautiful butterflies, moths, and songbirds to your garden. Because they are well adapted to local soil and climate conditions, native plants are easier to maintain than many other garden plants. They are often less prone to insects and diseases. 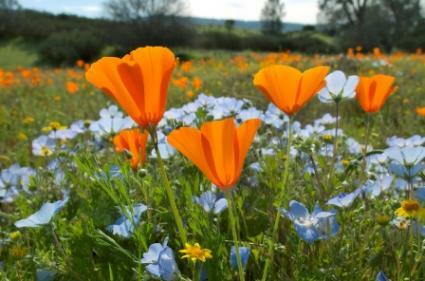 Growing native plants is important for sustaining wildlife in our communities. Wildlife flourishes amid indigenous plants. Though exotic plants may offer birds fruit, squirrels nuts, and hummingbirds nectar, they don't provide all the benefits that locally native species can provide. Natives meet the food and cover needs of all wildlife species including the little guys-the bugs that support food webs that include more visible creatures such as songbirds, chipmunks, and toads. We must bring back native plants to restore the critical, often unnoticed, pieces of our ecosystems. When you choose native plants for your landscape, you lessen the possibility that exotic garden plants will run wild and become invasive. An increasing number of exotic plants are becoming invasive-reproducing rampantly and diminishing the diversity of our remaining natural habitats. There are many exotic invasives that have been popular garden plants but should not be planted. These include purple loostrife, Japanese honeysuckle, Russian olive, burning bush euonymous, Common and European buckthorn, and many others. To find out which exotic plants to avoid planting in your area, contact a local extension office or native plant organization near you. You can use native plants in your garden to create a low-maintenance, sustainable landscape. They are so easy to grow because they are adapted to the climatic conditions of their growing area. When planted in suitable conditions, natives require no fertilization and, once established, little to no watering. Using natives conserves a scarce natural resource and saves you the trouble of watering. When you grow native plants you use far less water than with traditional gardens. Plants need to be watered the first year or two, but once established, are quite drought toleratnt. Most native plants are seldom affected by insect pests and diseases that afflict traditional ornamentals. Often, natives have adapted defense mechanisms to pests common in their habitats or have a high tolerance for pest damage. As a result, less pesticide is required to maintain natural gardens. Decreasing or eliminating pesticide use in the garden promotes biodiversity, reduces our exposure to toxic substances, and saves money. When you plant natives, you will spend more time enjoying your garden and less time maintaining it. Natives tend to grow more slowly than traditional ornamentals and require less work at garden chores such as mowing, pruning, fertilizing and dividing. You don't have to recreate a prairie in order to grow native plants; you can garden with them the same way you garden with any plants. Your garden can be as formal or informal as you want, and it could include a combination of native and cultivated plants. Native perennials, shrubs, and trees are adapted to a wide variety of growing conditions and fine native choices exist for virtually any garden environment. Pay attention to the growth requirements including needs for light, moisture, soil type, and salt sensitivity. Natives require one or two years to become established in your garden, so they will need to be watered during their first growing seasons. No matter where you landscape, think about incorporating native plants into your plans. Natural landscapes are needed everywhere to ensure the survival of a diversity of life. Around your home- If you care about the environment and want to learn about nature, invest in a natural landscape. Watch as it becomes more and more self-sufficient over the years. Around schools- A native garden provides an outdoor classroom and a safe place for children to enjoy the outdoors. Around businesses and public buildings- Reduce maintenance costs by installing a natural landscape. Planting native species is a great way to demonstrate commitment to your community. In flood or erosion-prone sites- Native vegetation can be used to filter contaminated stormwater. Consider planting a rain garden. Native vegetation buffers are especially important along water edges. Native vegetation can also help stabilize steep hillsides. In cities- The prevalence of artificial materials like asphalt, concrete, and roofing makes our cities hotter. We can mitigate this "heat island" effect by establishing more naturalized plant communities in cities. The biodiversity promoted by a native plant garden will reward you with satisfying experiences of observing the plants themselves and a host of other species including birds, insects, and mammals. In a small but significant way, you can help sustain an ecosystem and make a connection with the natural world-something that is way more satisfying than mowing the lawn.